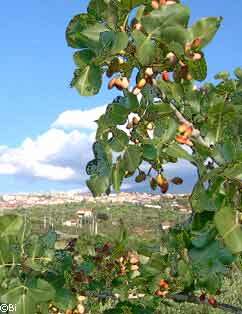 Sicily is the only Italian region where the pistachio ("pistacia vera") can be cultivated and produced. Bronte, with nearly three thousand hectares of land dedicated and specialized for this purpose, expresses principal area of cultivation (80% of the regional surface), with a production that has peculiar characteristics. Bronte is the Italian capital of the pistachio. Represents the principal economic resource of the territory, also because, unlike the product coming from America or Asia, whose kernel is nearly always yellowish, the bronte's pistachio is a fruit of high value, much appreciated in the European and Japanese markets, for its intense green coloration. In Bronte are picked up over 30 thousand quintals and is sold at about 5.00 to 7.00 euro per kilo with shell and at 12.00 to 15.00 without it. A wealth of about 20 millions Euro that represents 1% of the world production. 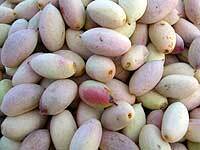 Certainly no farmer nowadays can make a living out of cultivating only pistachio. This activity occupies only a part of the working engagement and supplies only a part of the income; practically it is a second activity, but essential for the family survival and maybe it is more the passion than the economic reason to push the farmers to plant evermore pistachio trees (that shall give fruits only after about ten years). The green pistachio of Bronte could certainly be the city's emblem: its longevity, its willpower to overcome any adversity, even to bear fruits although clinging on lava rocks, reflect somewhat many characteristics of the bronte's people. A people that is not afraid of hard work, that has always struggled to take home what is necessary; that over the pistachio has built wealth, culture and its traditions, but also the habit to respect the territory in which lives. It is a precious fruit from ancient and noble origins, always a protagonist in the more refined kitchens, sought-after for its aromatic and pleasant taste. In particular, today, is utilized in the sphere of sweets and salami factories (confectionery, salami), but also in chemistry and cosmetics (well known the active principles of its oil, to beautify the skin). The oil extracted from the fruit, particularly delicate, finds application in dermatology for its high emollient and softening quality. Was known and cultivated by the ancient Jews and it was then considered a precious fruit: Jacob says to his sons to try to soften the heart of the Pharaoh Assurbanipal offering to him these gifts: «… a little resin, some honey, some myrrh, some pistachio and some almonds» (Genesi XLIII, v.11). 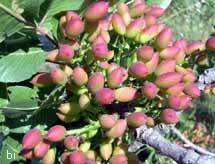 The pistachio (from the Greek Pistàkion) was already known to Assyrians and Greeks as a medicinal drug, a powerful aphrodisiac and as an antidote against bites of poisonous creatures. Avicenna, considered the Hippocras and the Aristotle of the Muslim East, in his "Canon of Medicine" prescribed it against liver diseases and as an aphrodisiac. 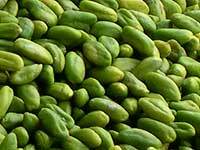 During the high middle ages were the Arabs that, having taken away Sicily from the Byzantine, incremented the pistachio cultivation and this had a great expansion in the territory of Bronte. 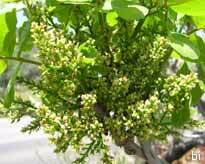 Of Arab origin are, in fact, the words frastuca and frastucara that respecti­vely indicate the fruit (in Arab "fustuq") and the plant. In the sciare (stony ground) of Bronte, in fact, was realized an extraordinary union between the plant and the lava ground, that continuously fertilized by the volcano' ashes, favored the production of a fruit that, for taste and flavor, is far superior of the remaining world production. Here, in a steep and stony land, the brontese peasant has reclaimed and transformed the lava flows of Etna in an unusual Eden, realizing the miracle of a plant born from the rocks to produce small, tasty fruits of the highest quality, of a beautiful color: emerald green, sought after and used in confectionery and gastronomy for their elevated organoleptic proprieties. The "green gold of Bronte" ("l'oro verde") in the various phases of ripening and (low to the right) an old machine, invented by the brontese Nunzio Di Bella, to separate ("sgrollare") the husk, the leathery wrapping that covers the fruit. 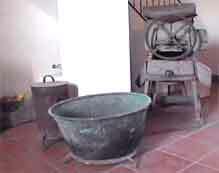 On the left of the old machine, two old container of the local tradition: "u stutafocu" (used to close in it the embers to obtain charcoal) and the "men­zarangiu" (big copper container to boil foods and also to make the mostarda, boiled prickly pears juice with a little flour). The Mediterranean has always been one of the principal exchange centre for the enhance­ment of the world alimentary products. Traditionally has been the sea of the taste, of the flavours , of fragrance, of spice. A peculiar characteristic that has formed the culture, the economy and even the scenery, changing it deeply and in a way almost irreversible. Spice in general but also basil, rosemary, pepper, olives, citrus wine and the vine and other thousands of products and cultivations that have invaded and changed this cultural and geographic space bringing to goods exchange and also to a cultural comparison maintaining a constant common value of taste and traditions. The products, generally of mid-eastern origin, represent a particular aspect of this patrimony and have had a remarkable influence in the European and Mediterranean gastronomic culture. Cuscus, pepper, wine, chestnuts and hundreds of other products derive from progressive and millenary exchange and the Mediterranean sea has always been its communication space. 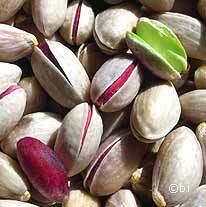 Pistachio, an exceptionally antique fruit, known to Babylonians, Assyrians, Jordanians, Greeks, mentioned even in the book of Genesis and reported on the obelisk erected by the king of Assyrians around the VI century B.C., is one of the alimentary products included in the gastronomic patrimony of the Mediterranean people. Of this precious fruit , brought to Sicily by the Arabs, Bronte represents the principal production area in Italy. 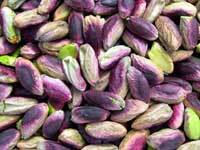 Iran is the biggest producer of pistachio in the world with a surface of 230.000 hectares followed by Turkey with 39.000 hectares, United States with 31.000 hectares and Syria with 20.000 hectares. In Europe only Italy, Greece and Spain produce pistachio / the first two with about 9.000 hectares and Spain with 1.500, of which 2.000 in Andalusia. 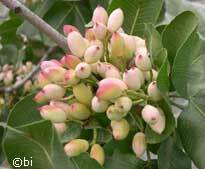 In Sicily the pistachio grows prevalently in Bronte occupying there about 80% of the cultivable area, also in Adrano and Ragalna, in the province of Agrigento, particularly in Favara and Raffadali, and finally in S.Cataldo, province of Caltanissetta. 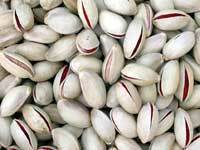 The average biennial Sicilian production is about 32.000 quintals of shelled product, 80% of which is exported abroad. In Bronte there are Cooperatives for the wor­king and marketing of pista­chio and a confe­ctio­ners association that utilize the fruit for their products as pastry, cakes, ice cream, fillette, doves, nougat, creams and crushed pistachio sauce. Bronte's pistachio, always threatened by inferior quality imports, shall gain shortly a due recognition of product DOP: the pro­posal of the Regulations of produ­ction for the "Pistacchio verde di Bron­te" (Green Pistachio of Bronte) is already been published on the Official Gazette. 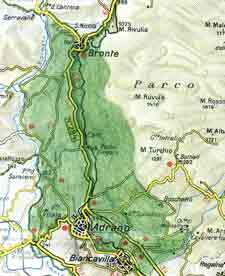 The Dop (Deno­mi­nation Origin Protected) refers to a zone of production, compri­sed between 300 and 900 meters above sea level, that falls in the territories of Bronte, Adrano and Biancavilla. Among the dried fruit, the pistachio ker­nel can offer the major caloric contents: 683 kilocalories compared to 649 of the walnut, the 542 of the almond, the 571 of the peanut. The green pistachio of Bronte. Three principal phases of the processing: Tignosella (pistachio, just picked, deprived, of the husk and dried in the sun), shelled (deprived of the shell), peeled, deprived of the kernel' skin, through immersion in hot water and properly dried and brought to a dumpiness of 3-4%. It contains, on average, more than 20% of proteins, the 50/60% of oil (68% of oleic acid, 17/19%), also sugars, in particular glucose, mineral salts and vitamins, in particular the precursor of vitamin E.
Every year in some small streets and squares of Bronte's inner cen­ter, in the period September-October, goes on, since several years, the feast of the Sagra del Pistacchio, (the Pistachio feast). It is the occasion that the city offers to its many visitors to let them know the refined "gold of Bronte". The highlight of the Feast is the tasting of the fruit and of the pista­chio related products that go from sausages to pistachio pastry, from sweets to ice cream, and lots of other delicious things. (With pistachio in Bronte is produced also a liquor, the pesto (crushed pistachio sauce), some cheeses, salami, the classic and ancient fillette ...and other preparations with a unique taste). 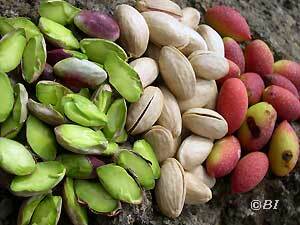 Very many are the miraculous characteristics tied to use of pistachio. One, among many, handed over by the elders and reported also by Lemeriin his "Treatise of foods and of the way to preserve them.." (Venice, 1705), says that "excite the ardors of Venus and increase "the feminine humor".